I was trying this example “How to Enable Prepopulating Fields” but I was using Google Sites to display my form. Can I use Java Script on special Other Platforms? I am not an experienced programmer, but I like how jotform is flexible. I like the ability to enhance my form so that when a user changes one thing, the form responds, making it easier to fill out. For example, I see the ability to make Conditions to show and hide form fields. I would like to make conditions change the same field. So you must be referring to this user guide: How to Enable Prepopulating Fields. I think that's possible on Google Sites. Try using Embed Gadget and embed your form's full source code there together with the scripts provided on that user guide and see if that works. Feel free to update us the result so we can assist you further. 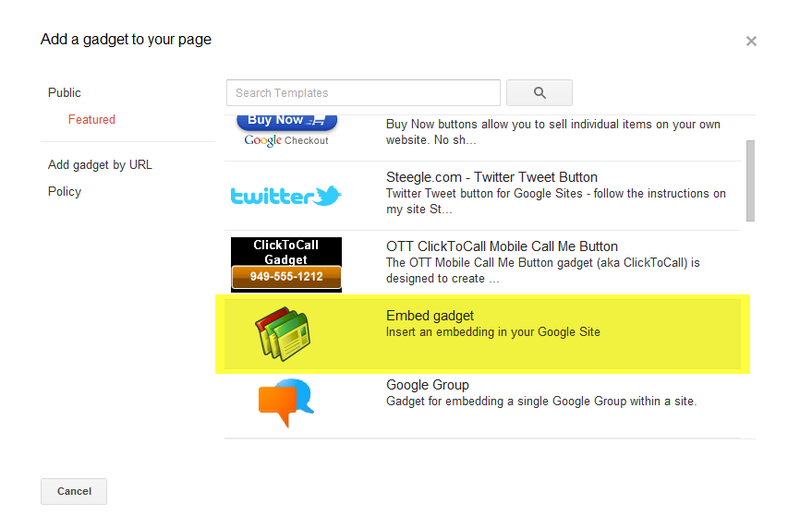 Here's how you can get the Embed Gadget on Google Sites. 1. Go to your Google Site. 4. Scroll down and select "Embed Gadget". Regarding on the form conditions, it's possible with JotForm. I'd suggest to check this link to learn more about Conditional Logic on Forms.